I love working out and in general most fitness related things. I'm lucky I live in a city where there are so many different options for exercising, besides the normal run-of-the-mill gym. This morning I had the opportunity to check out the newest cycle studio to hit Charlotte. 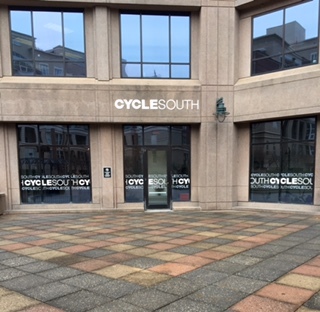 CycleSouth is located in uptown and is officially opening its doors on January 11th. I lucked out with a free preview ride through Scoop Charlotte and couldn't wait to try it out. Uptown is about 20 minutes from where we live so I jumped on the highway this morning and made it to the studio with 10 minutes to spare. Fortunately there is a parking garage in the same building as the studio. CycleSouth provides free validated parking with your ticket. Once I entered the studio I was greeted by a super friendly employee who told me to check in and leave my things in the locker room. Lockers are provided free of charge but remember to bring a lock with you as they do not have any (not sure if they will have any in the future). Jason was the instructor and kept the class motivated and entertained along the way. You could tell he was working as hard as the class was! I really liked my experience at CycleSouth this morning and am considering purchasing the introductory special. With our YMCA membership it is hard to justify too many other costly work outs, but I like having variety in my exercising and can easily spread those classes to once every week or every other week. Check out CycleSouth if you're looking for a new cycling studio. Thank you for riding with us this morning! We are so glad to hear that you enjoyed the ride and hope to see you back in a bike soon!